I use an Igloo "Playmate Plus" beverage cooler as a haybox cooker. I simply stuff a bunch of towels into it, add my hot food container (usually a pot of rice) , close it up and let it sit for about 45 minutes. To make the rice I cook 1 cup of rice, 2 cups liquid (I use chicken broth) and any seasonings, in a 1 quart glass (Vision Ware) pot. I let the broth come to a boil, turn down the heat and let it simmer for about five minutes. 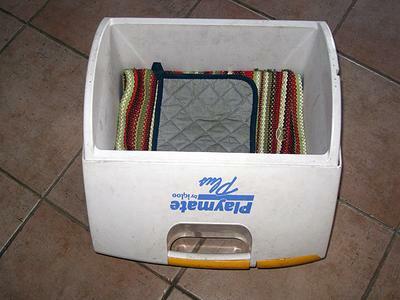 I then put the pot into the Playmate cooler, pack it with towels and close the lid. After 45 minutes in the haybox the rice is fully cooked, all of the liquid has been absorbed, and it's still plenty hot! Great haybox cooker, and so simple. Any one can take advantage of this fuel saving idea because there is not anyone probably who does not have a cooler available for use. Join in and write your own page! It's easy to do. How? Simply click here to return to Building a Haybox Cooker.